This project was for a company in Wales that manufactured bath chairs. 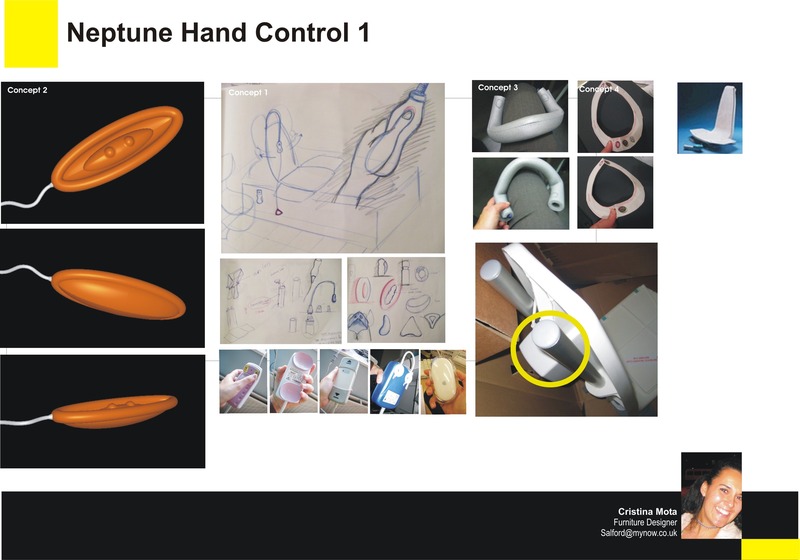 Brief: to redesign a hand control that operates the bath chair. Problems with existing product: heavy and sunk to bottom of bath. Bulky and hard to hold due to its size/weight. Needed 6 A1 batteries to operate. When batteries died there was no way of knowing how low the batteries were which meant you could be left inside the bath and unable to lift the chair out of the water! The small photos under the sketches below show various hand controls from other bath chair manufacturers. Some had suction pads to stick to the side of the bath, some with cable, others without. In general they were bulky and hard to hold by an average user, let alone someone who may have arthritis. 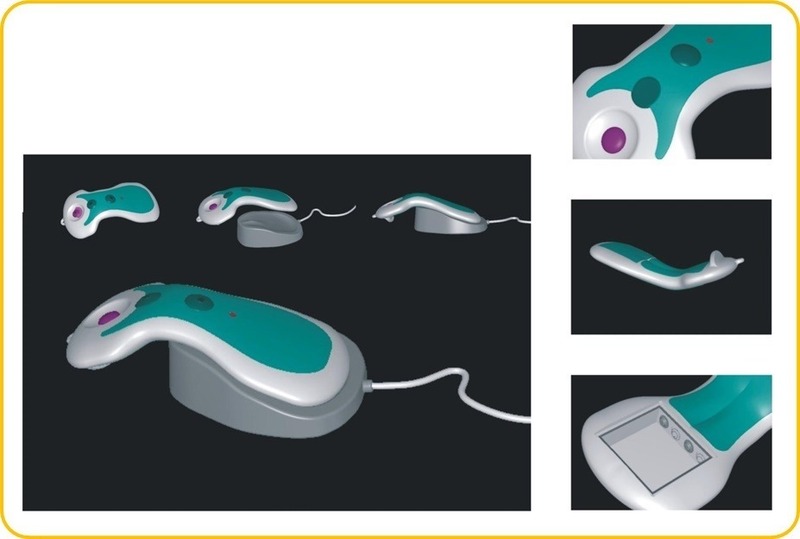 Therefore my aim was to reduce the size of the hand control, or make it as ergonomic as possible. 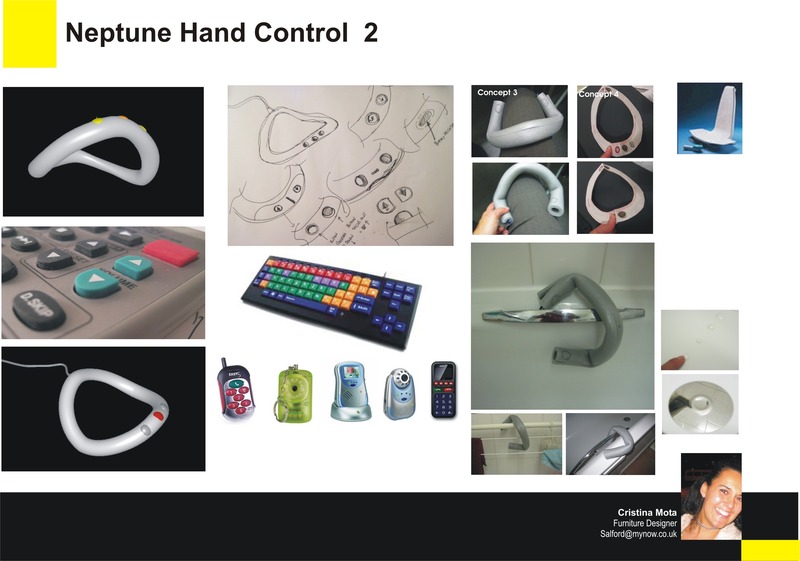 The designs and sketches below show the initial ideas, Neptune hand control 1 concept was to design a “boat-like” control which floated, therefore would be always surfacing the water. Its shape and rubber finish prevent water from entering the inside and creates a pleasant finish to touch. The “up” and “down” buttons stick out, so that they easily recognised by touch. One is slightly smaller than the other to distinguish between them. worked on the principal that the hand control could sit on the edge of the bath (due to its curved shape and outer material which adheres well), or the user could hook his/her arm through it and have it near him/her at all times, even hang it over the chair as indicated with yellow circle (this way it is always at hand). The coloured buttons you see in the photos are the research I did into material finishes with adherent qualities. This was the final design presented. It included all the functions and design features that I wanted it to include. The blue/green area is made of a rubber that adheres to the side of the bath, and also does not slip in the users hand, in order to make it as light as possible, I used a charger which would be placed near the bath, but far enough from the water. The buttons on the top are to lift the chair “up”, while the recessed purple button is to slide the chair “down and into the water”. there is a small hole below both green buttons, which is to alert the user when the battery is running low. A light will come on to let you know when you need to re-charge it.